» Ne mai dunque avro pace...Ohime! In May 1946, when Milan’s venerable La Scala theatre reopened after World War II, conductor Arturo Toscanini selected Renata Tebaldi, then 24, to sing music by Rossini and Verdi for that watershed concert. ‘Ah, la voce d’angelo’ – the voice of an angel – was Toscanini’s reported verdict. In her heyday, she was known as ‘La Superba’. At the Metropolitan Opera, where she was utterly adored, she was, less poetically, ‘Miss Sold-Out’. Her stage career lasted some three decades, and she retired in 1976 at the comparatively early age of 54. The items on the 1949 recital were first issued by Decca on 78rpm, later collected on LP. The 1955 recital was issued on two ten-inch discs in February and May 1956, then issued collectively on an LP in November 1958. 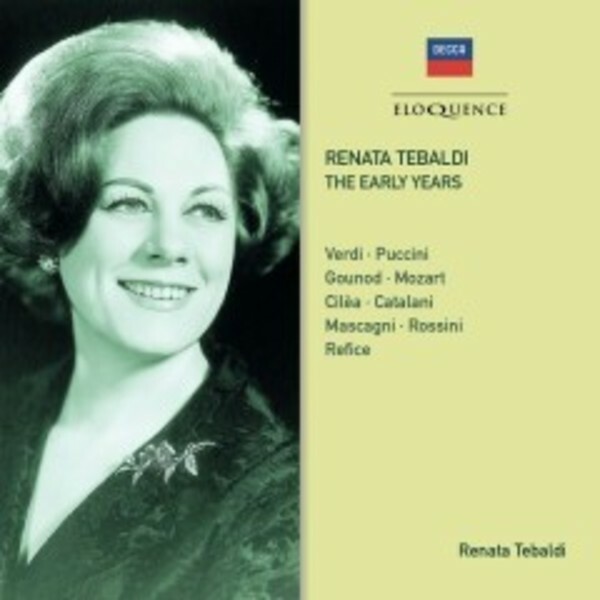 Those who heard Tebaldi live remarked that her studio recordings did not do her full justice, but they were best-sellers for Decca, and continue to remain artistically and commercially viable today.